If you planned on skating the new Suffolk park at Bennett's Creek this weekend, you might want to change your plans. 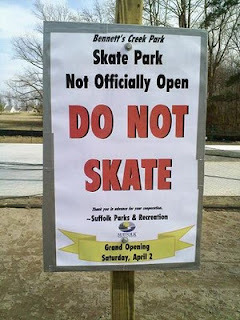 According to the sign the park isn't opening until April 2nd. The flat concrete at Lake Meade was being worked on today, and according to the contractor, the concrete will be stable enough to skate on in three to four days but they are probably going to be doing landscaping so I'd expect an April 2nd opening date for that park as well. Hey, this is my first comment on your site. I’ve been reading it for a while in my RSS reader but haven’t commented before. Anyways, thanks for the post.